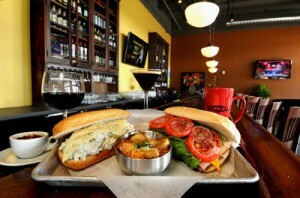 Check Out What Those around town are saying about Toast! Come in and Try us Today! One of the best small – town Nebraska restaurants exists within the Lincoln city limits. Set apart from the rest of the city, the Fallbrook development in northwest Lincoln off Nebraska 34 features a business district that complements residence. Among the businesses is Toast. Northwest Sixth Street and Fallbrook Boulevard – Quiet today but has potential to be northwest Lincoln’s gathering place. Corner includes festival square and retail-business buildings. A stop at the new Toast in Fallbrook is kind of like a trip to the museum. 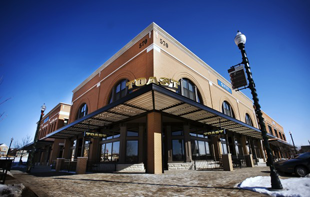 That’s because the owners – Tony and Wendy Young and Mike Martin – used materials from old Lincoln and Omaha establishments in creating their new venue. Click Here to head to the Toast Menu or Click Here to Print Your Own! Call us at 402-261-8859 with any questions. 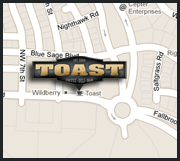 Click the Map Below for Detailed directions to Toast! See you there! Then be sure to visit LeadBelly! With two locations in Omaha's Midtown Crossing & Lincoln's booming Haymarket Neighborhood. Enjoy a contemporary culinary twist on the traditional bar and grill. 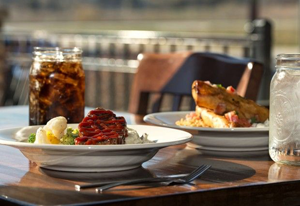 Using the freshest ingredients, LeadBelly offers outstanding casual contemporary American pub fare. Click here to check out the menu or for more information.